Thanks to Snopes.com, here's a list of clickbaiters, and fake news sites. It's a trip that will take you down an alley where social media exploits the dark side of things. Have you ever wondered where the flotsam floating around the internet comes from? Well this field guide will set you straight. 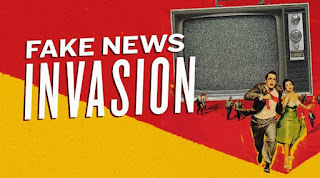 The sharp increase in popularity of social media networks (primarily Facebook) has created a predatory secondary market among online publishers seeking to profitably exploit the large reach of those networks and their huge customer bases by spreading fake news and outlandish rumors. Competition for social media’s large supply of willing eyeballs is fierce, and a number of frequent offenders regularly fabricate salacious and attention-grabbing tales simply to drive traffic (and revenue) to their sites. Take a few minutes and GO HERE to get the full scoop. While the myriad sites referenced above represent only a small sample of the overall “satire” nuisance on social media, many widely-dispersed fake news claims have originated with them. All of the above-mentioned sites exist solely to spread false information, and none can be trusted as legitimate sources, no matter how compelling their claims might be.